When you’re looking to purchase a new stethoscope, the options can be nearly overwhelming. With a wide range of brands, models, and price points ‒ not to mention the great number of online and brick-and-mortar stores ready to accept your money ‒ how do you narrow down your choices and make the right selection? Following is a quick guide to help you choose and locate the best possible stethoscope for sale. Do you need a cardiology scope, or one for more general purposes? Do you need to be able to distinguish the finer heart sounds and murmurs? Does your work involve a lot of exterior noise? Do you examine children regularly, or are you a veterinarian who examines small animals? If you’re a student, have you experimented with different scopes to learn what works best for you? The most discriminating audio capabilities won’t do you a lick of good if your scope is painful to wear, so make sure the earpieces are right for you. Some people prefer hard eartips, while others swear by the softer ones. It’s also possible to order custom eartips for a truly perfect fit. Other considerations for comfort are weight, flexibility, and length of tubing. Shorter tubing may provide better audio, but longer tubing requires less bending and is much easier on your back. A heavy stethoscope might cause neck or back pain over the course of the day, but if it is flexible enough to carry in your pocket, it can still be a great option. Your new stethoscope can be a sizable investment, which makes a good warranty another important consideration. MDF offers the most generous warranty with free replacement parts for life. Ultrascope, Prestige, and ADC provide limited lifetime warranties. Welch-Allyn has 5 and 10 year warranties, with a special unconditional warranty for students. Littmann’s warranties range from 2 to 7 years. You’ll find medical supply and uniform stores in most locations across the country. Unfortunately, as much as we love to support local businesses, these smaller operations simply can’t afford to provide a wide range of instruments at discounted prices. On the other end of the spectrum, it’s possible to find stethoscopes for sale on eBay at massively reduced prices. Like most things in life, if it looks too good to be true, it probably is! There are a lot of “look-alike” or “knock-off” products on eBay, and you must read descriptions very carefully to make sure you get exactly what you think you paid for. In general, we find eBay to be far too risky for a reliable purchase. For safe purchases with the widest selections at the most competitive prices, we recommend the stethoscopes for sale at Amazon or eBay. Be sure to take advantage of the huge number of customer reviews available at Amazon, and choose wisely! We wish you the very best of luck with your purchase, and a long and happy life in the medical profession. What’s the Best Stethoscope for Blood Pressure Readings? Looking for the best stethoscope for blood pressure readings? Blood pressure assessment is one of the most frequent health care tasks. That’s why it’s important to have a reliable stethoscope that makes assessment easy and accurate. We’ve turned to the reviews of nurses and EMTs to help us locate the best stethoscope for blood pressure readings. And, with over 600 online reviews to study, we can say pretty definitively that we’ve found it: the Littmann Classic II S.E. What makes the Classic II S.E. the best stethoscope for blood pressure readings? The Classic II S.E. weighs 125 grams. Compare this to the Omron Sprague Rappoport, which comes in at a very hefty 272 grams. That’s a huge difference when you’re wearing it around your neck for hours at a time. Reviewers also liked the Classic II’s soft earbuds, both for comfort and for the improved acoustics that come with a good fit. The best stethoscope for blood pressure readings will efficiently eliminate background noise. And no one knows background noise better than emergency medical personnel. EMTs, paramedics, and emergency room nurses all find the Classic II S.E. to be a superior noise reducer. 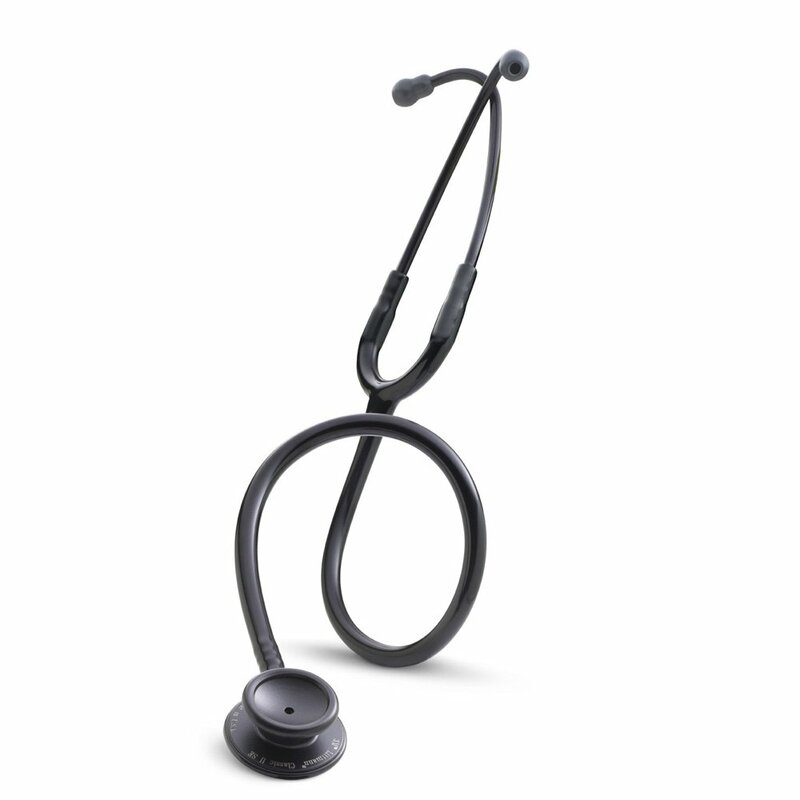 3M Littmann gives the Classic II S.E. a rating of 7 out of 10 for sound quality. Steeles.com calls it “the industry standard.” And all over the internet, medical professionals rave about their ability to hear better with the Classic II S.E. Doesn’t anyone have complaints about the Littmann Classic II S.E.? Nothing is perfect ‒ not even the Classic II S.E.! In a total of 657 customer reviews, 59 users gave this scope a rating of 3 stars or below. The vast majority of complaints? Reviewers were disappointed with the color of their new stethoscope. The most common problems involve the color purple, so take note ‒ what Littmann calls purple is probably closer to blue. Another frequent problem is purchasing from disreputable sellers. Buyers talked about receiving a Littmann knock-off instead of the real thing, or a used stethoscope instead of a new one. Be especially wary of this when you’re ready to make a purchase, and be sure to place your order with a reliable supplier. The people really have spoken: the Littmann Classic II S.E. is far and away Amazon’s top selling stethoscope. With 506 5-star reviews, it’s also one of the best-rated. Medical professionals all over the world love this scope ‒ and we think you will, too. What’s your favorite stethoscope? Let us know your opinion about the best stethoscope for blood pressure in the comments below. The first step in placing the cuff correctly is to locate the brachial pulse. There can be considerable variation from one patient to another, so avoid making assumptions. After you find it, place one finger directly over the pulse point and reach for the cuff with your other hand. Now you can put the cuff on the patient’s arm. Align the artery label right above the pulse and leave about an inch between the cuff and the pulse point. Before you start to inflate the cuff, place the stethoscope on your patient’s arm. Use some light pressure on the bell and then start inflating. Doing it this way gives you the opportunity to listen while the cuff is inflating. Take notice as soon as you hear the characteristic whooshing of the Korotkoff sounds. You’ll know exactly when to stop inflating the cuff when you hear the sounds stop. Use a nice, even drop rate for the most accurate results. If the needle is dropping too fast, you might end up with a falsely low systolic reading. If you let it go too slowly, your patient might fall asleep waiting for you. Listen for the first audible whoosh ‒ that’s your systolic pressure ‒ and the last audible whoosh, which gives you the diastolic pressure. Remember to use your ears, and not your eyes. The needle on the pressure gauge will definitely show some bumps during the drop. But this may or not have any correlation with what you’re hearing. Using the needle alone will not give you an accurate reading. An accurate blood pressure reading depends as much on your skills as it does on the quality of stethoscope you’re using ‒ and remember that your very best instrument is always the one between your ears! What this video to see how to use a stethoscope for blood pressure. It’s important to know how to wear and how to hold a stethoscope. The picture of a doctor in a white coat with a stethoscope hanging around her neck is iconic. Yet studies indicate most doctors aren’t using their stethoscopes correctly. Today’s time-starved practitioners rely on newer technologies for testing cardiac and pulmonary function. Unfortunately, these are expensive to use and often unnecessary. Used correctly, a stethoscope is a more effective way to screen children for heart defects and monitor patients with heart and lung problems. Place the ear tips gently into your ears, and turn them so they point slightly forward. This makes a good tight seal, allowing you to focus on the sounds your stethoscope transmits. You’ll know the seal is right when ambient noise becomes very faint. Unless your stethoscope has a tunable diaphragm, switch between the smaller bell and the larger diaphragm by turning the chest piece in a half-circle, until you hear it click. Then tap the bell and the diaphragm to hear which one is operating. Hold the chest piece between the index and middle fingers of your dominant hand. Avoid using your fingertips on the edge of the diaphragm or bell ‒ rubbing them around the chest piece will cause extra noise and interfere with listening. Keep your thumb under the stethoscope tube to keep it from rubbing against your patient’s skin. This, too, will limit the noise interference. Using a gentle touch, press the stethoscope against your patient’s skin. A stethoscope is neither a relic nor a prop. Knowing how to wear and how to hold a stethoscope correctly gives you immediate access to a cost effective and efficient diagnostic tool. Practical Science: How Does a Stethoscope Work? Have you ever asked “how does a stethoscope work?” Depending on which legend you believe, the French physician René Laennec may have devised a simple monaural stethoscope to avoid putting his head on the bodies of his unwashed and odorous patients. Or he may have done so to enable examining modest Victorian ladies in a thorough, yet decorous fashion. Both stories have their charms. In either case, modern stethoscopes have come a long way. However, they retain a lot of their original simplicity despite radical improvements in quality. What are the parts of an acoustic stethoscope? The chest piece, usually round, is the part that touches the patient and captures sound. A dual head chest piece is two-sided: one side contains the larger, disc-shaped diaphragm, and the other side is the bell-shaped part, conveniently called the bell. The bell is best for pinpointing low-pitched sounds, while the diaphragm works best for high-pitched sounds. Rubber tubing carries the sound from the chest piece to the headset, which is a set of metal tubes culminating in soft earpieces that go directly into the listener’s ears. When a stethoscope is placed diaphragm side down on a patient’s chest, the sound waves vibrate the diaphragm. The resulting waves are channeled up through the tubing and into the headset, and then to the wearer’s ears. When the bell is used instead, it’s picking up the vibrations of sound waves against the patient’s skin, which cause the bell to vibrate, and again funnel up through the tubing to the headset and ears. Normally, the sounds we hear are the results of scattered sound waves. But the tubing of a stethoscope acts to focus the waves, which reflect back and forth against the interior walls of the tube. For the technically inclined, this process is called “multiple reflection.” This process of focused, repeating sound waves is what makes a stethoscope work, by amplifying the sound of a heartbeat and allowing a medic, doctor, or nurse to hear it clearly. Anyone who has ever cupped their hand to their ear can attest to the effectiveness of multiple reflection. Yet the practical science that resulted from adapting this simple technique has saved thousands of lives and revolutionized the practice of modern medicine. Here’s a video explaining how a stethoscope works.